If your baby boy is a super spy in the making, with a smile that melts hearts and makes the mummies swoon, then you should be all over this little gem I discovered from La Redoute! A smashing tuxedo, dinner jacket and romper suit that could be for bedtime or even worn at parties and special occasions and weddings! Great for the Christmas season or for James Bond fans. The cry who loved me. 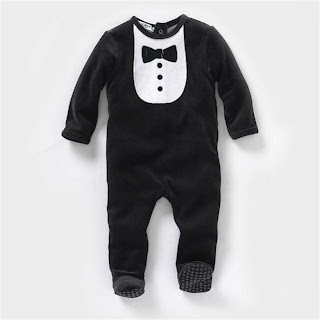 It comes in a range of sizes from newborn up to two years old. Get your hands on this babygrow now! I know I will. CRYfall? Get it? Although in reality it would be the other way round, Fall then cry. God, I'm useless!